I often come across folks who are getting started with their startups. Many of them are looking for advice and their is one question that almost everyone of them asks without fail. How can we scale up marketing for our startup? It’s like they’ve figured out everything else and the only thing that is to be solved for now is Growth. First time founders are particularly prone to this line of thinking.Typically in most such cases, there are a few things that seem to be working. The site is getting a bit of traffic or their app is getting a few downloads. A few users are signing up or leads are being generated. There are a few active users. Some revenue or repeat usage of the product. To the founder’s credit, they’ve built a product and figured out some stuff in getting their product in front of the potential users. However, more often than not they end up jumping the gun in thinking that all the basic groundwork is done and all that remains is reaching to more people. But incidentally, there’s more to it than meets the ‘optimistic founders’ eye. Let’s dig a little deeper. A startup’s life comprises of multiple stages that need to be sequentially navigated. You’ve figured out a way to solve a problem that enough users care enough about (to pay enough for). Market — You might solve a problem for a handful users but are there ‘enough users’ that feel the pain/need for a solution? Product — You might have come up with a solution but does it ‘really resonate’ with your users? Monetisation — Your users might be using your product to solve a problem but are they willing to ‘pay reasonably’ for it(or is their a different way to monetise like Ads and such)? (You might want to re-read the points in quotes above). Amidst all the buzz around fundraising, press-coverage and exists, the urge to ‘grow fast and kill it’ is understandable. However, before worrying too much about the non-existent growth you absolutely need to understand if you’ve found a product-market fit. Important: A vastly important point here as I’ve learned over the years is that Market > Product. “Which market to operate in” could be a great heuristic to work with. More on that in a later post. Why is Product-Market Fit Important? Premature Scaling or spending effort and money on marketing a half-baked product to solve a half-thought through problem is potentially dangerous. It requires a significantly harder push to market a product that claims to solve a problem most users don’t realise enough(they have) in a way that doesn’t make sense to them. By resolving to spray and pray marketing you might acquire some users, a few of which might translate into paying customers but more importantly, it will give you an illusion that you’ve figured out what people want. It’s this precise illusion that’s the biggest problem. Most people who find themselves in this illusion end up adding more features into their product, continue their spray and pray efforts to acquire users, trying to raise funds and more often than not reach the woeful end of “Running out of money”. Contrast this with a situation in which you’ve found Product-Market Fit. In which case, every single step mentioned above will seem like a breeze (ok, almost like a breeze). 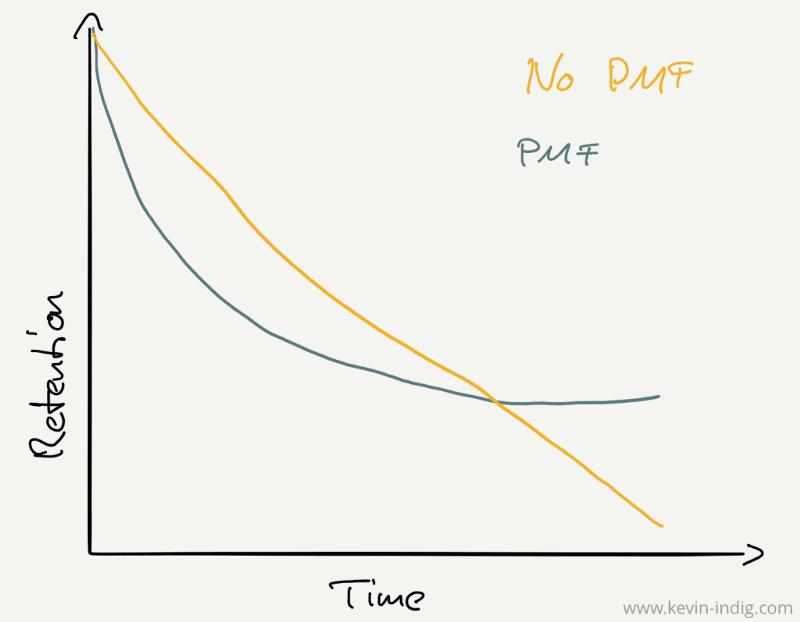 Also, it’s worth noting that one important and often overlooked factor that seems to add up to the illusion of figuring out PMF is the founders psychology. While things begin with a sound footing, many a times the empathy to truly solve a customers problem and delivering a wow experience is quietly taken over by a personal insecurity and need for validation. Once in this zone, the founders tend to look and even gloat in any metric that confirms their illusion. So, being self-aware about your psychology is a must for course-correction. 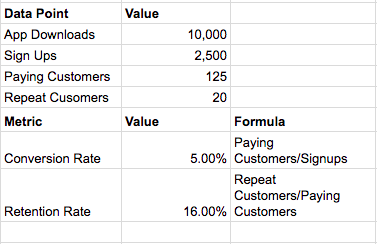 If these two metric are reasonably good, chances are you have attained PMF and can now focus on scaling growth. On the other hand, if these two metrics, especially the Retention Rate are in single or early double digits there’s a problem. It’s likely that you are yet to find a PMF and you need to go back to the drawing board and figure that out. Let’s take an example of an app that lets you improve your health by connecting with you a nutritionists or fitness coaches. 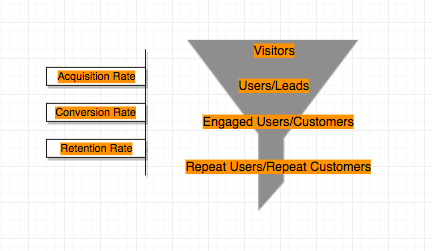 To check the PMF status we will have to look at the user funnel numbers. As visible from the data above, it looks like a case of Pre-PMF as both conversion rate and retention rate are weak, therefore they are better of trying to first find a PMF and then worry about growth. I’d like to conclude by saying that at an early state of your startup while you must continue to feed top of your funnel by acquiring some users (more data to analyse the better) but don’t be too eager to press the gas pedal on marketing or growth till you’ve figured out a set of users (around 100 for a B2C business) that truly love what you are doing. Till the time you’ve found out those users, improve your product offering or consider targeting a smaller niche with your existing product. Thanks to Sameer Guglani, Navneet Singh, Monica Jasuja, Aditya Sahay and Lakshay Pandey for their feedback. This entry was posted in marketing, start-up, Strategy and tagged business, growth, marketing, product-market fit, Strategy on September 4, 2018 by mayank.